J. Brian Clarke of Calgary, Alberta has won the inaugural A.E. 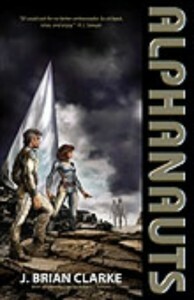 Van Vogt Award for his novel Alphanauts along with a $1200 honorarium sponsored by the Winnipeg Science Fiction Society. The annual award is designed to honour a work of science fiction from an author in Western Canada. Book Two of Nina Munteanu’s Splintered Universe Trilogy, Inner Diverse, was released by Starfire on December 13th 2012 and is now in bookstores. In Book Two of this metaphysical space thriller trilogy, detective Rhea Hawke continues her quest for truth and justice in a world that is not what it seems. Rhea’s relentless search takes her to the far reaches of the known universe from the treacherous Boiling Seas of the Weeping Mountains of Horus to the blistering deserts of Upsilon 3. Amidst the turmoil of an imminent extra-galactic war, Rhea holds the key even as those she trusts betray her. Cover art for Inner Diverse was done by Costi Gurgu, 2012 Aurora Award finalist for his cover art for Outer Diverse. Costi is eligible for the 2013 Aurora Award for Best Artist for his work on Inner Diverse. The thrilling conclusion of the Bloodlight Chronicles trilogy. Set in a world where global economic activity is carried out in a virtual-gaming realm, a blood-transmitted virus with rejuvenating effects has become a black-market staple, forcing infected “Eternals” into a tightly knit underground where they must hack the V-space for food and shelter. After their leader, Helena Sharp, begins to mysteriously degenerate and flees, the Eternal community is thrown into chaos, fearing that their immortality has ended. When the young clone Niko discovers that her gifted daughter carries the future heritage of humanity in her augmented DNA, she travels home to confront her progenitor, Phillip Davis, with a litany of experimental abuse. Phillip has fully integrated his persona with the AI Beast who controls V-space, and with the aid of a charismatic avatar, he embarks on a program of manipulation and control that will redefine the boundaries of death and consciousness. An interview with Steve Stanton is now online at Open Book Ontario. An interview in his role as President of SF Canada is now online at CBC Books: Canada Writes. A “writing tip” to career novelists is online as part of Sci-Fi Odyssey. The Bloodlight Chronicles: Redemption is available wherever great books are sold, and via payday direct from ECWpress.com. John Park’s novel Janus was launched by CZP on September 22 at Can*Con in Ottawa. Psychological drama, mystery, Janus is both violent and lyrical as it follows conflicts of love and identity to a bitter climax and a somberly optimistic conclusion. In the near future, Jon Grebbel arrives on the colony world of Janus and finds himself without memory of his life on Earth. It seems the journey has caused memory loss in many of Janus’s colonists. While Grebbel wants to start his new life, he wants his memory back, and starts treatments to restore his past. But he begins to doubt the glimpses of the past they reveal. He meets Elinda, an earlier arrival, whose lover, Barbara, vanished and then was found lying in the woods apparently brain-damaged. Elinda has also lost her memories of Earth, but unlike Grebbel has abandoned the effort to recover them. Now their meeting brings them a glimpse of an experience they shared back on Earth. . . . Listed by Kirkus among “worthy runners-up” for the “can’t-miss” fantasy and science fiction books of October 2012. 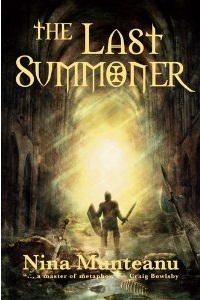 The Last Summoner is available through Amazon, and is currently among the top ten bestselling titles in historical fantasy. You can find Nina online at her site, The Alien Next Door. 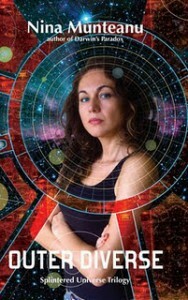 Audiobook of Nina Munteanu’s “Outer Diverse” is OUT! 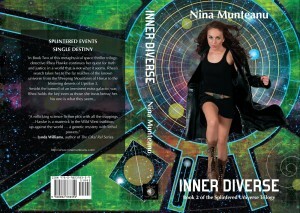 The audiobook of Nina Munteanu’s space thriller Outer Diverse was just released by Iambik Audiobooks. Outer Diverse is the first book of the Splintered Universe Trilogy, set in and around the Milky Way Galaxy. The first book begins as Galactic Guardian Rhea Hawke intestigates the massacre of an entire religious sect, catapulting her into a treacherous storm of politics, conspiracy and self-discovery. Her quest for justice leads her into the heart of a universal struggle and toward an unbearable truth she’s hidden from herself since she murdered an innocent man. “I just finished and thoroughly enjoyed “Outer Diverse”. A metaphysical, Sci Fi, Thriller with rich characters. Dawn Harvey told the story brilliantly and played the characters wonderfully. Definitely worth listening to.” –Dan Wallace, narrator, Lions Den Productions.